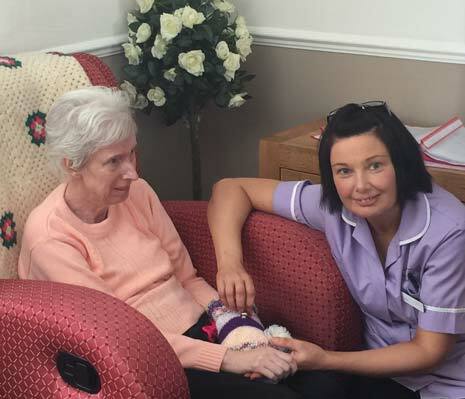 'Twiddle Muffs' are providing a "calming and relaxing influence" for elderly residents living with dementia at Barnfield Care Home, in Chesterfield. The furry hand warmers have been adorned with ribbons, buttons and textured fabrics for residents to twiddle in their hands. The creations have been a hit - as those living with dementia often have restless hands and respond well to keeping them occupied, according to Barnfield's home manager Andrea Broadhead. She said: "The Twiddle Muffs provide a source of visual, tactile and sensory stimulation and, at the same time, keep residents hands snug and warm. "They have proved hugely successful and had a calming and relaxing influence after friends of one of our residents provided the first as a gift." Shirley Belcher and Janis Allen are friends of 63-year-old Barnfield resident Jill Stapleton. Shirley has known Jill for over 35 years. Janis is a neighbour and member of the Wessington and Brackenfield WI, where Jill was a secretary. The pair first created Twiddle Muffs after both responded to a Derby Hospital's Charity appeal for patients with dementia. Following the appeal, the pair had separate ideas of knitting Twiddle Muffs as gifts for Jill, who was diagnosed with dementia at 58 years old. They provided the gifts to husband Peter Stapleton, who visits Jill at Barnfield Care Home daily. He said: "I was shocked when they both had the same idea but really grateful. "The Twiddle Muffs have been so beneficial for Jill. She's always enjoyed twiddling things in her hands so when Shirley and Janis gave me the muffs to hand over to Jill, she was very happy. She has enjoyed hours of time playing with them." Following the success, Shirley and Janis have teamed up to knit Twiddle Muffs for all Barnfield Care Home residents living with dementia. Andrea added: "We are so grateful to Shirley and Janis and cannot thank them enough. "Something as simple as Twiddle Muffs can provide enormous benefits for those living with dementia - and their generosity will have a huge impact on the lives of our residents." For today's World Suicide Prevention Day, 70 organisations in England are joining together in a big national push to reduce deaths by suicide.